Auckland may be New Zealand’s largest city, but its urban feel is complimented with city parks scattered everywhere. The country’s clean green reputation is amplified in Auckland parks and gardens. While each park offers something unique, they all provide a welcome escape from the city life that surrounds them. 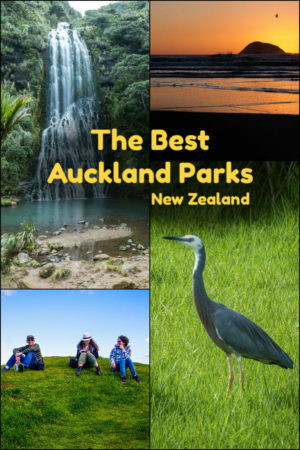 Below are what I consider to be the 12 best Auckland parks. 15 Does your city have open spaces like the stunning Auckland Parks? Cornwall Park Auckland has it all. Tall trees, native birds, and wide open spaces are just the beginning in the largest green space in the city. Cornwall Park is a quiet place for a picnic, or an opportunity to get some exercise. Various groups meet in the park weekly, practising different skills from Tai Chi to sword fighting. At one end of the park on an extinct volcanic cone sits One Tree Hill, at the other end is Stardome Observatory. Also in Cornwall Park are massive trees, rolling paddocks (many with sheep), the Cornwall Park Cafe, historic buildings, a bistro, walking tracks, and multiple playgrounds. Like many parks in Auckland city, the well-established Cornwall Park trees offer shade for picnics. Black swans glide over the natural spring-fed lake at Western Springs Lakeside Park. It is home to the Auckland Zoo and the Western Springs Stadium. 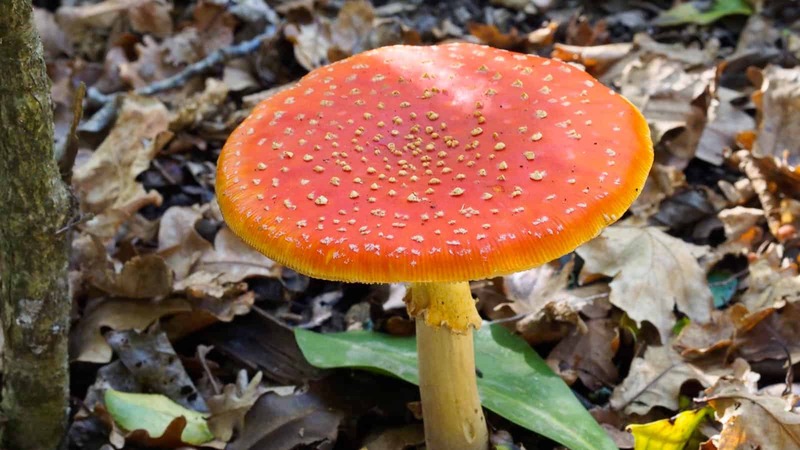 Nearby, we find the Museum of Transport and Technology (MOTAT), Chamberlain Park Golf Course, and Jagger’s bush where I spotted several colourful mushrooms. Black swans in Western Springs Lakeside Park. 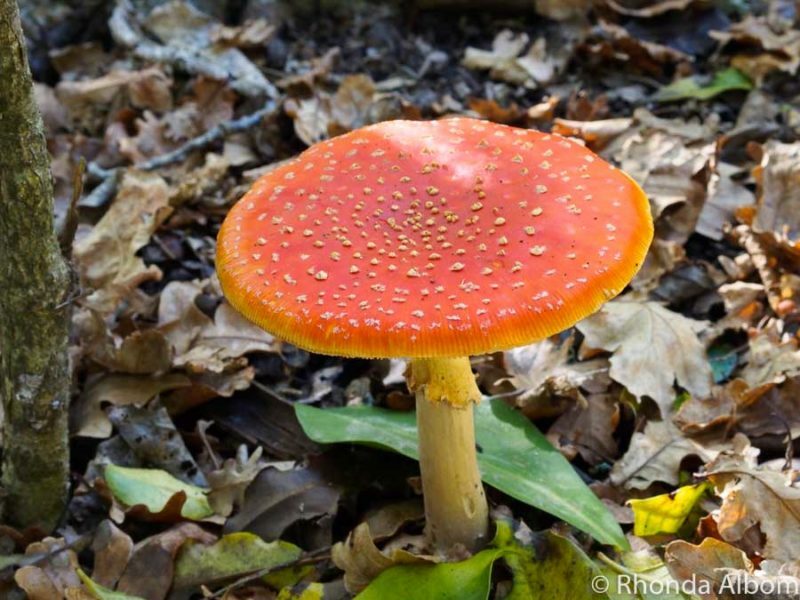 This colourful mushroom spotted in Jagger’s Bush is commonly known as the fly agaric, a toadstool with hallucinogenic properties if prepared in a certain way. Most locals and visitors know this one as the Parnell Rose Garden. Visit from late spring to early autumn to see some of the 5,000+ roses that bloom here annually. The Auckland Domain is the city’s oldest park, as well as one of the largest. It is built around the cone of the extinct Pukekawa volcano and is home to hiking trails, a duck pond, the Auckland Museum, a cafe, the Wintergarden, a natural amphitheatre, sports fields, and Auckland City Hospital. 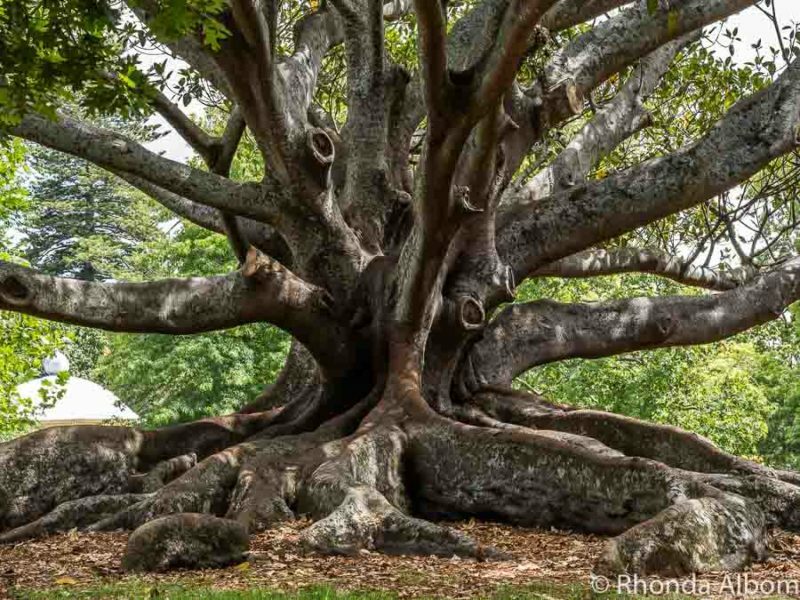 An impressive tree in Auckland Domain Park. Just a few blocks off of Queen Street, the benches around the Victorian fountain in Albert Park are one of my favourite spots for people watching. The park is surrounded by two major universities (The University of Auckland and Auckland University of Technology) and the Auckland Art Gallery Toi o Tāmaki. 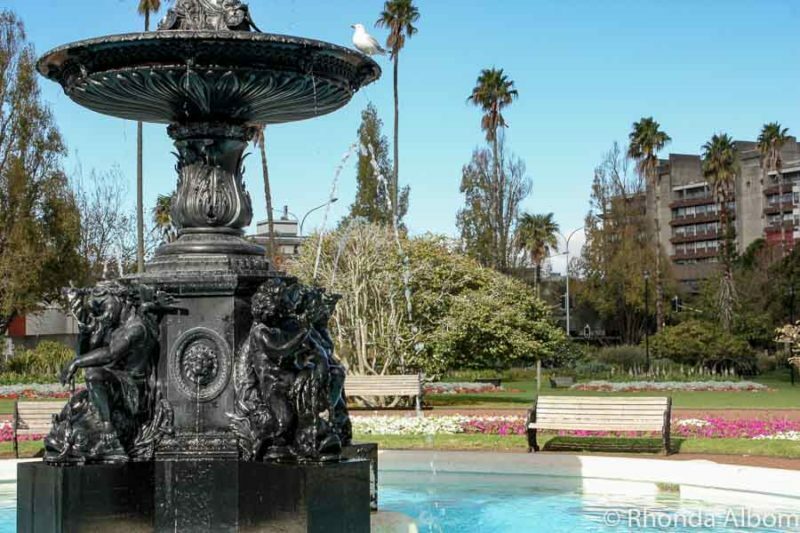 The fountain is near the centre of Albert Park Auckland. This is my personal home away from home. An open bird sanctuary, it is my favourite of the Auckland Regional Parks and provides hours of hiking trails, three beaches (more depending on the tides), bouncing spring lambs, cows, campsites, and even a waterfall. Surrounded by a predator-proof fence, the park is now the only mainland home to Little Spotted Kiwi Birds. Shakespear Park Auckland is at the end of the Whangaparaoa Peninsula. It is close to my home, and has won my heart. 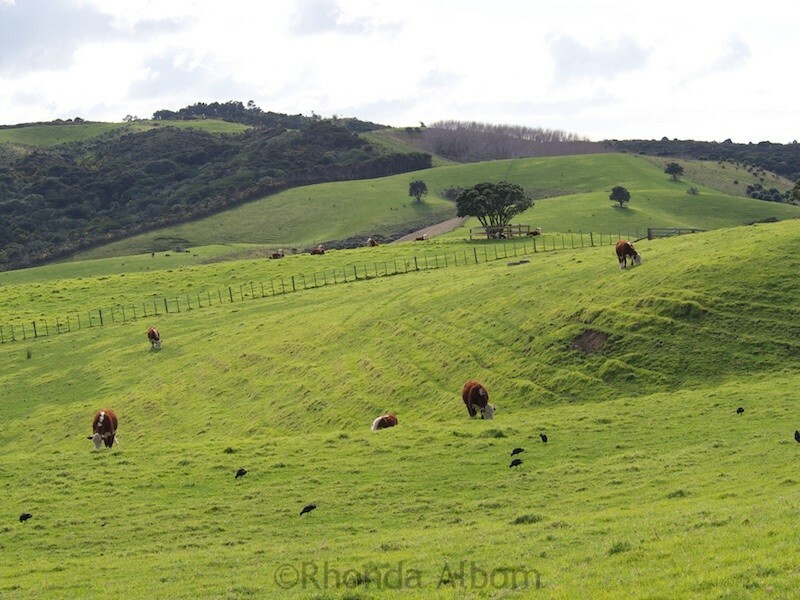 Cows in a field in Shakespear Park. Another park with a predator-proof fence, there are critically endangered takehe now living here. 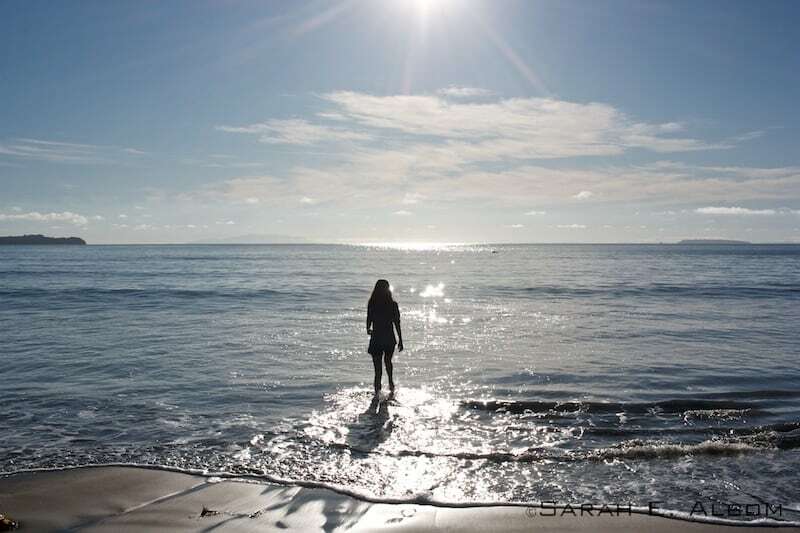 Tawharanui is also home to hours of hiking trails, a campsite, and one of Auckland’s most beautiful beaches. The downside is that it is on the limits of the Supercity, and not that easy to get to without a vehicle, and even with one, it will take a while. Hiking along the cliff in Tawharanui. Photo Credit: ©Sarah Albom. All right reserved. 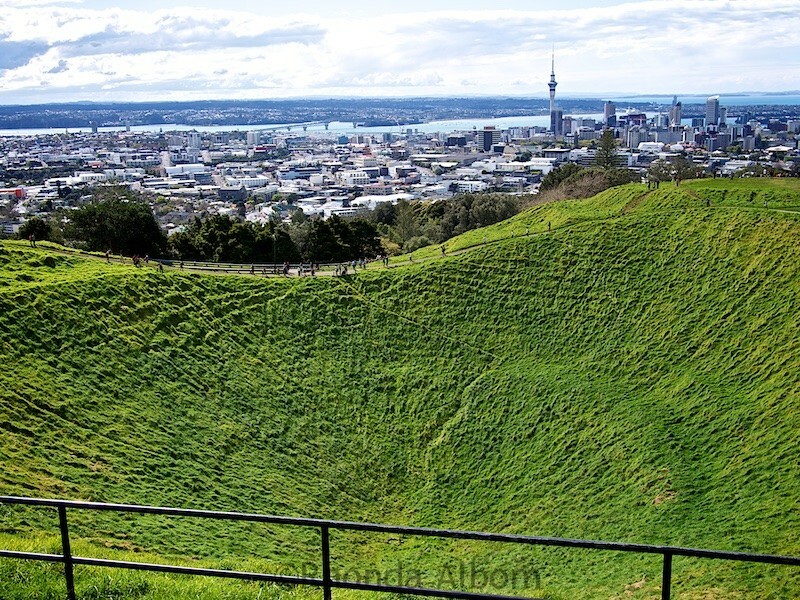 The summit of Mt Eden, an extinct volcano, is the highest natural point in Auckland offering an impressive 360-degree view. However, it is the 50-metre deep crater that attracts many visitors to this spot. View of the crater and city at the top of Mt. Eden. Once a military lookout site, this beautiful reserve still has bunkers, cannons, and tunnels to explore. Being on the north side of the Auckland Harbour Bridge, the site provides one of my favourite views of Auckland City. North Head is located in Devonport. 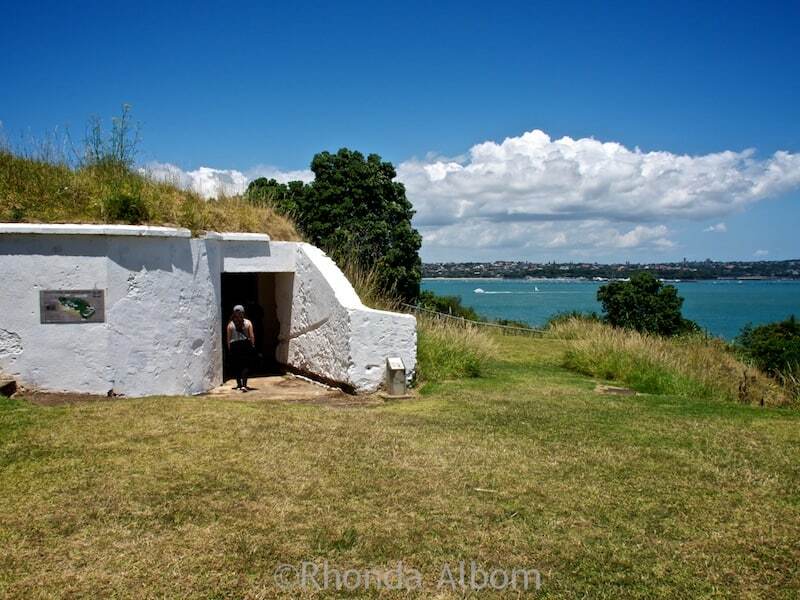 Entrance to one of the tunnels at North Head Historic Reserve. The campgrounds at Mahurangi West are even farther north than Tawharanui but also worth the drive. Sarah recently camped at the Te Muri campsite here. It’s another of the clean, green Auckland Regional parks with an inviting beach. Beach at Te Muri campsite, Mahurangi West. 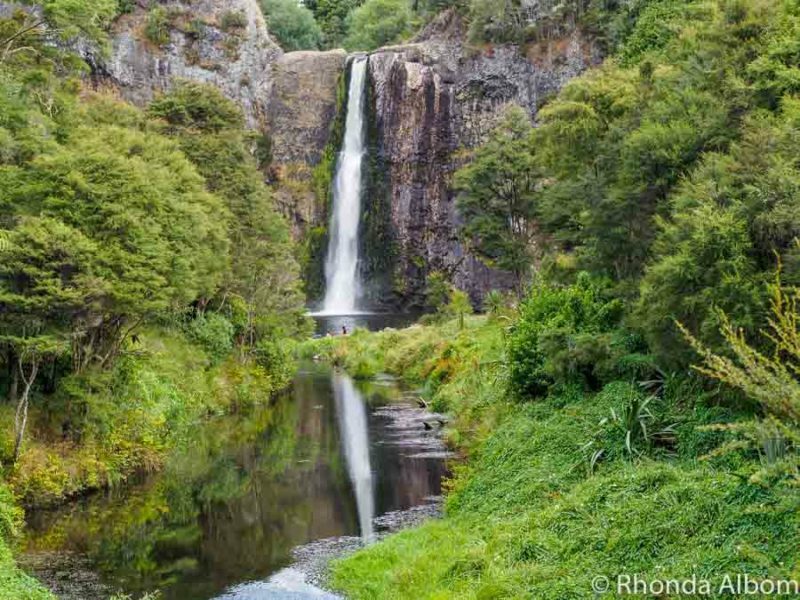 The Hunua Ranges cover over 400 square kilometres of lush green forest. The Hunua Falls are about 60km southeast of central Auckland. Popular with families, the park offers hours of hiking trails, campsites, and a waterfall into a swimming hole. Currently, large sections of the Hunua Ranges regional parks are closed to visitors to prevent the spread of kauri dieback disease affecting the trees. Heading out to the parks in West Auckland will surely bring you to the Waitakere Ranges, the subtropical rainforest of the region. Like the Hunua Ranges, much of the park is currently closed to hiking to prevent the spread of Kauri dieback disease from killing the trees. 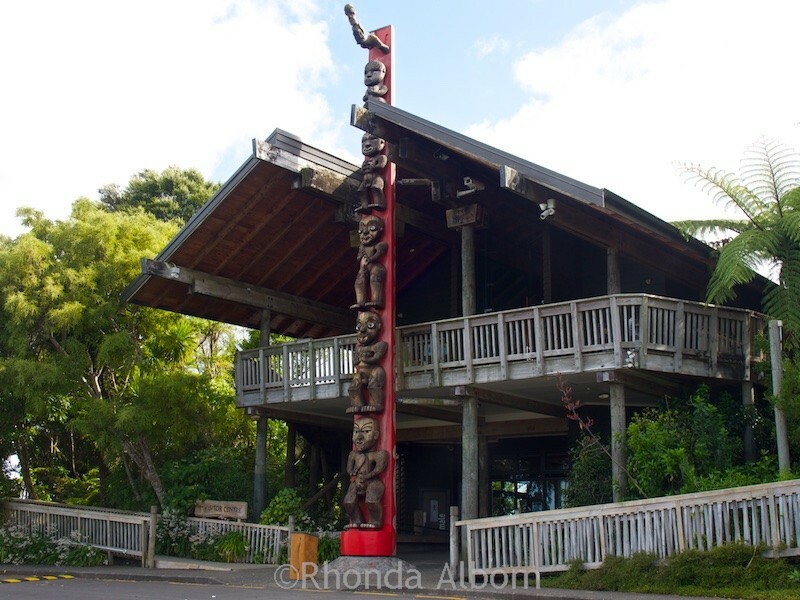 This is the Arataki Visitor Centre. The park is the spiritual home of the Te Kawerau a Maki, the local kaitaki or guardians of the land. Our girls were young when we first moved to New Zealand. I remember being so impressed by the vast number of Auckland playgrounds. When you’re a kid, these are the fun parks found in Auckland. As my girls grew, skateparks became more important. While there are substantially fewer skate parks than Auckland playgrounds, there are enough. Check Auckland for kids for a list of Auckland skateparks and playgrounds. ⇒ Check out this 75 Free and Nearly Free Things to Do in Auckland New Zealand. Does your city have open spaces like the stunning Auckland Parks? 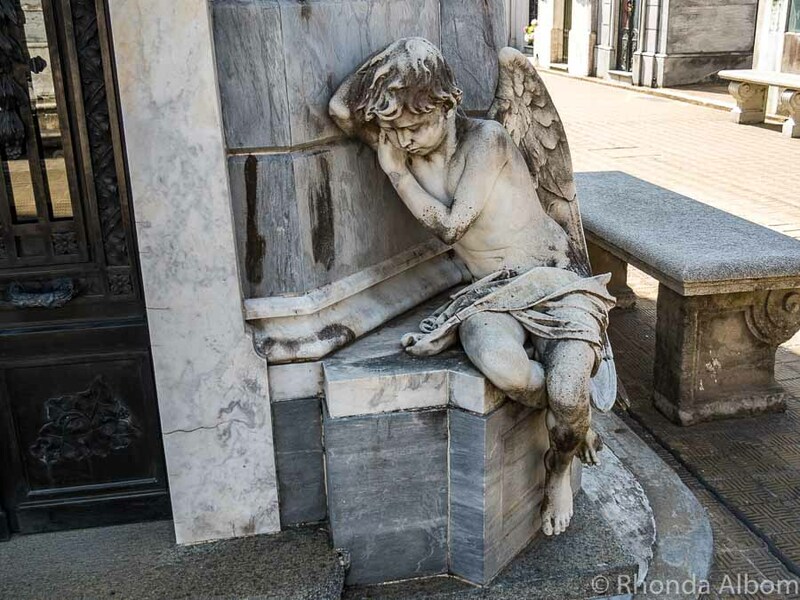 Previous Post: « Recoleta Cemetery in Buenos Aires: Artistic or Eerie? That tree is incredible! Have a great week! Such beauty, all captured magnificently on camera! ♥ Australia and New Zealand are definitely on the bucket list. 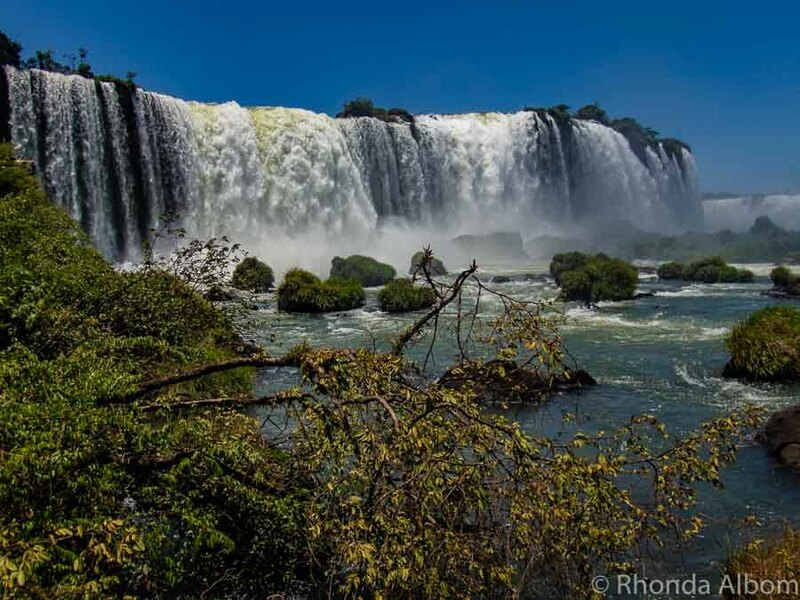 Thank you for sharing another fabulous travelogue. Oh wow, that so beautiful. It doesn’t even look real, looks more like from a movie or book. That tree is wicked looking. Now I have to go to New Zealand. You have some beautiful parks there! 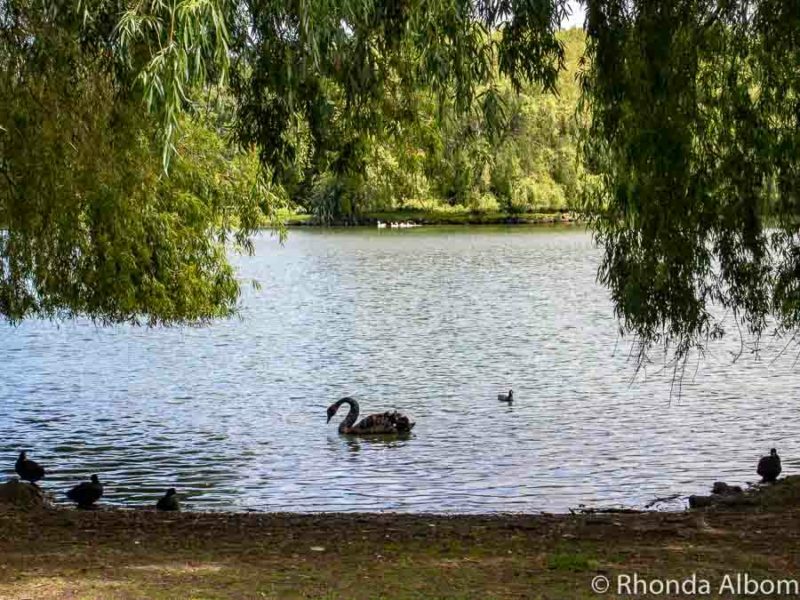 I would love to see the black swans at Western Springs Lakeside Park. I’ve never seen black swans….although we do have white ones that come to our dock every morning. The Wintergarden looks amazing also. Is that a greenhouse? 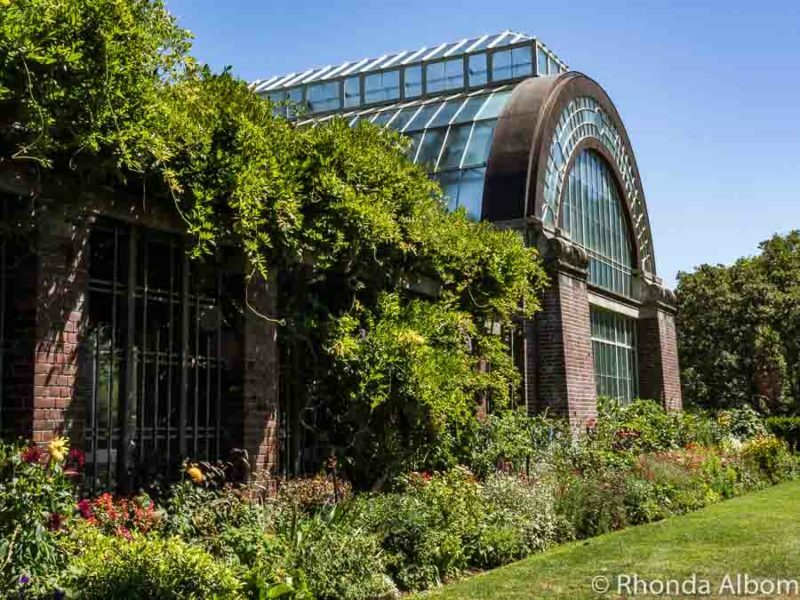 Yes, there are two giant greenhouses. One is tropical and the other grows New Zealand subtropical plants and flowers. What beautiful sites and photos! Such beautiful parks…looks so relaxing and close to all things nature! Thanks for sharing! New Zealand is on my wish list of places to visit. I’ll have to visit Auckland. So many neat places you have featured here. Cornwall park is my favourite, as it’s so close to where I live now. I also take a walk through Keith Hay Park and up Mt Roskill sometimes. It’s not quite as nice a park as Cornwall – but the view from the top is still worth the walk. Love the sculpture and those amazing trees! I’ve never seen anything like them before. wooow…also love the parks and green public space like that. Surely what we need for fresh air and clean earth. I think it’s so ingrained in New Zealand life, people sometimes forget how lucky we are. That statue would surprise me, too. It’s grand! Most interesting all around. Very nice. Enjoy your fall. Gorgeous parks and pictures! I love the tree with the amazing stem at Auckland Domain. I think parks are so very important in urban areas and I’ve seen many interesting ones. They give you breathing space and remind you of the gift of beauty we have around us. I absolutely LOVE that tree in Aukland Domain. Oh the stories it could tell! One of the many nice things about living in New Zealand is the low population density, so we always have breathing space, parks just make it better. Here in the Twin Cities we are blessed with lots of parks, many of them with lakes. Which, since we live in the Land of 10,000 Lakes, shouldn’t be that big of a surprise. But even our own little suburb has a lot of small parks and greenbelts and walking trails, which makes it very easy to enjoy the outdoors when it’s nice. I always forget that Minnesota has 10,000 lakes, must be a really beautiful state.I have only crossed in from Wisconsin to visit family in Minneapolis, and that was 40 years ago. I do remember the parks and gardens in London, it’s much more tidy than New Zealand. Parks are such treasures. Thank goodness people have had the foresight to set aside space for us to roam and enjoy. I loved the sculpture and those immense trees. I could sit under one of those and read all day. I agree, both on being thankful people had foresight and on the ability to sit under one of those trees for a while. Not anymore. Most of our parks have been taken over by gangs or the homeless or both. Most folks don’t visit the parks anymore. Wow! I would love to visit those parks. We do have some beautiful areas near us, as well. We live on a peninsula so there are some beautiful beach access parks within minutes of our house, and the city we live in has a nice walk along the waterfront in the harbor. We also live just 10 miles from one of the biggest metro parks in the United States, although it is technically in a different city. Point Defiance Park is second only to Central Park in size for a metro park – it’s a great place to walk, bike ride, beach comb, hike through trees, visit flower gardens, or see an award-winning zoo and aquarium. It also has some nice open grassy areas for play. We live on a peninsula near a park as well, but it’s a bit more rural so it didn’t make the page here. These photos were amazing. We don’t have trees around Amherstburg that excite like the trees that you showed in your blog. The one in Albert Park was unbelievable. As a child I would have loved to climb this one. Have a wonderful Friday Rhonda. See ya. Some of the old, established trees in New Zealand are amazing. Some of the biggest trees are up north. Albert Park looks amazing! I love that sculpture. And look at those trees! I love trees. I’d just be walking around snapping hundreds of pictures of those gorgeous trees. I have taken hundreds of photos of the trees, people, fountain, and the flower beds at Albert Park. Lots of cosplay in your parks. There probably isn’t as much cosplay and LARP as it would appear from my photos. Remember, one of my girls is quite into this and I go along as a photographer. Those trees are both interesting, like a bunch of rooted elephant trunks. They also look fun to climb. We don’t have a lot of parks, but the one we have in the capital city isn’t as restful. Nice pictures. Great parks – so important to a city. I love the trees and the sculptures. Obviously it takes a while to grow trees that spectacular, but sculpture in parks is something that more should do now!